Alternate Title: The Secret of N.I.M.H. BCDB Rating: 4.5/5 Stars from 11 users. This page has been viewed 57 times this month, and 8473 times total. Cartoon Characters: Mrs. Brisby, Jeremy, Teresa, Timmy, Nicodemus, Great Owl, Auntie Shrew, Farmer Fitzgibbons, Mrs. Fitzgibbons, Cynthia, Billy Fitzgibbons, Mr. Ages, Miss Right, Sullivan, Jenner, Justin, Martin. 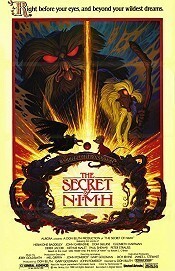 Return To "The Secret Of NIMH"
I saw this movie 4 times in the theater. I went out and bought the book. I even watched the completely irrelevant sequel. This movie is so awesome that my friend named her son Nicodemus after a character from this film. It's quite a bit darker than 80's Disney flicks were. Characters curse, bleed and even die. Listen for a very young Shannen Doherty and Star Trek's Wil Wheaton as the Brisby kids. Sadly, the DVD is fullscreen so I'm waiting for a widescreen version before I buy it. This 1982 Don Bluth Production is one of his best animated movie since he left Walt Disney studios and went on his own. 'The Secret of N-I-M-H' is truely a timeless tale of a widowed female mouse named Mrs. Brisby and her love, courage and most of all her determination to move her home away from the farmer Fitzgibbon's plow when spring came early and Timothy her youngest son had pneumonia and could not bee moved for three days, She tries to stop the farmers tractor and succeeds with the help of her busybody neihbor Auntie Shrew. Mrs. Jonathan Brisby is going to need a lot more help in moveing her house and home to a protective part of the stone, With help from a lovelorn Crow and the mysterious Rats from the Rose bush and the wise advise from the Great and fearsome Owl, alone with a magic amulet, she does the impossable. It's a timeless wounder that will transport the whole family to an enchanted world! This movie stands as one of my all time favorites. The characters are wonderful and the story, while it takes a few leaps of logic, flows beautifully. Mrs. Brisby is one of the trully great animated characters, and it's a shame that she was so badly served by this movie's sequel. something i dont agree with is "that fool" refering to walt disney disney him self was awesome. The real fool is isner he is the one who ruined disney. Ive never seen a movie like nimh in my life in animated films done in the usa it was more like a cross between anime and standard animated films. Inimh is the film that i say can be credited with giving us all the land before times and basicly all of the other films that bluth has done sence this is the film that gave bluth his nondisney name. Imo when bluth passes on it will be as great a loss to the animated film community as when walt disney passed on. With that said good job on all your films don and keep up the great work. Goodness gracious. If you haven't seen this move, do so - right now! Drop what you're doing and pick up the DVD and watch it. This is easily one of the few best...no - it is *the* best animated film ever made. The voice acting is superb, the music is an orchestral fantasy, the animation is dazzling and gorgeous, and the writing and plot are engrossing and heartfelt. There is no excuse for anyone to have not seen this movie at some point. ...And anyone who mentions Disney in the same breath as NIMH has to go stand in the corner, because they weren't related in the least, and that fool doesn't deserve the honor. 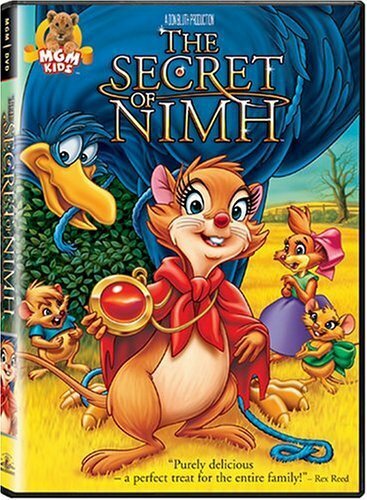 The Secret Of NIMH by Big Cartoon DataBase is licensed under a Creative Commons Attribution-NonCommercial-ShareAlike 4.0 International License.